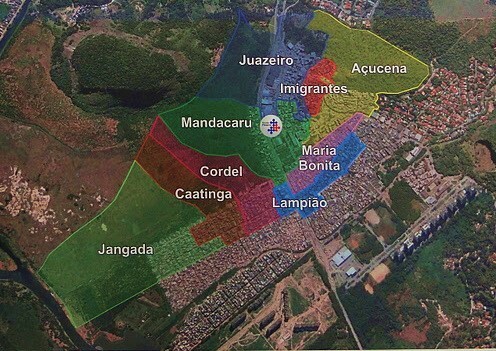 We recently published a paper describing our efforts to adapt street audit strategies for use in a large informal community, Rio das Pedras (RdP) located in Rio de Janeiro, Brazil. We developed a smartphone-based systematic observation protocol to gather street-level information for a high-density convenience sample of street segments in RdP (N = 630, estimated as 86% of all street segments in the community). The street audit protocol was built on the Fulcrum app deployed on smart phones and allowed street auditors to record observational data into forms on the phone’s screen and to capture geotagged images from the phone’s camera. The app also had a mapping interface to help guide the field team around RdP to the selected street segments that were being audited. In 2015 in the U.S. 5,376 pedestrians were killed and 70,000 were injured. The Built Environment and Health Research Group has just launched the Interactive-Pedestrian Injury Mapper (I-PIM) website (HERE), to crowd source the collection of data on locations where pedestrians have been hit by automobiles. Our goal is to collect location data on intersections where pedestrians have been injured so that built environment, side-walk and road-way risk factors for pedestrian injuries can be identified. I-PIM has a Google maps based tool that allows a user to place a pin on the intersection or street where they were hit and to then map the route they walked prior to getting hit. I-PIM then asks some questions about the user, such as age and gender and then asks some questions about the collision, such as the type of vehicle that hit the person and whether they received medical care at the scene or had to go to the hospital. Once injury location and route data from a lot of people have been entered into I-PIM, we plan to use Google Street View to virtually walk the routes and collision site and collect data on built environment, side-walk and road-way risk factors such as the presence of cross-walks, stop signs, visual distractions and blocked sight lines. Our goal is to understand the ways in which pedestrian and roadway infrastructure at intersections that people crossed without being hit differs from intersections where they were hit. If you have been hit by an automobile and would like to enter your information into I-PIM click HERE. At BEH, we’re interested in how your residential neighborhood affects how physically active you are. But we’ve come to understand that being active as not just one thing and not merely a matter of expending calories. That is, walking is different from yoga is different from basketball is different from a seven-minute workout every morning. They’re all activity, and for the most part, they’re all good for you, but two people could both meet the recommended number of minutes of activity per week, but arrive there through very different patterns of activity. We focus a lot on walking, because there’s extensive evidence that walking is one of the easiest ways to integrate activity into your daily life. As a result, we expect that making our cities more walkable could be a great way to get our population more active. But for any given person, meeting activity recommendations may be easier for some activities than for others. Few older adults play basketball, say, but a lot of older adults say they’d like low-cost, low-impact activities, like walking and gardening. A few years ago, we started characterizing the patterns of types of activity older adults engage in, focusing on the NYCNAMES-II cohort, a cohort of older adults in New York we surveyed three times over five years. We found that adhering to specific patterns of activity predicted lower BMI better than simply analyzing total activity alone, and also explained prevalence of depressive symptoms. We also know this cohort’s neighborhood conditions (including neighborhood disorder, a conditionwe’vestudiedextensively) are correlated with their total activity and with their depressive symptoms. So we thought we might learn something by looking at change through time in activity patterns in the NYCNAMES-II cohort, and whether those changes we correlated with neighborhood conditions. In a paper that’s just hitting the web now at the American Journal of Epidemiology, we used a latent transition analysis to explore how the activity patterns of the study participants changed through time, and then explored individual and neighborhood predictors of those changes. We found that there were 7 common activity patterns and that the most common changes between those patterns came from adding or removing one activity type (e.g. walking, sports & exercises, etc.). Neighborhood unemployment rate was the only neighborhood level factor we found to be consistently associated with transitioning between activity patterns. Our results were encouraging. 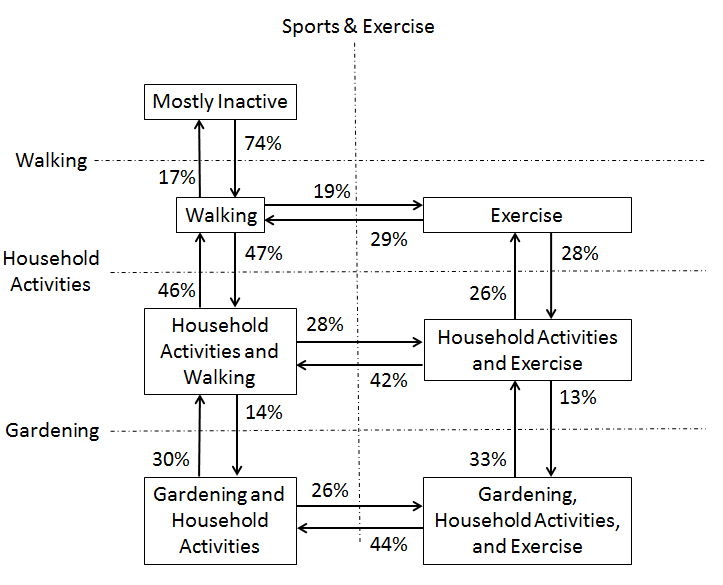 The latent transition analysis gave us a better picture of the kinds of changes older adults in New York City make in their activity, and we learned that, for example, engaging in gardening at any given time is not just a matter of having access to gardening space and an inclination to garden. We anticipate that future latent transition analyses, with more people followed over more years could give us further insight into which activities we might suggest to which older adults to best increase population activity levels. In collaboration with researchers from the New York City Department of Health and Mental Hygiene we recently published an article in the American Journal of Epidemiology showing that diabetics living in neighborhoods with more advantaged economic environments, greater walkability and healthier retail food environments have an improved ability to achieve glycemic control. Hemoglobin A1C data from the New York City A1C Registry for 182,756 adults who had 1,273,801 A1C tests from 2007 to 2013 were analyzed along with data describing the neighborhood contexts they lived in. The odds of individuals achieving glycemic control in the most advantaged residential neighborhoods (better economic conditions, greater walkability, healthier retail food profiles) was two and a half times greater than in the least advantaged. Furthermore, individuals who lived in the most advantaged residential neighborhoods achieved glycemic control in a shorter period of time than individuals who lived in the least advantaged neighborhoods. For those who moved during the 2007 to 2014 period, moving from less advantaged neighborhoods to more advantaged neighborhoods was associated with improved diabetes control, while moving from more advantaged areas to less advantaged areas was related to worsening diabetes control. This is the first longitudinal study to examine the relationship between residential neighborhood environments and individual’s ability to control their diabetes. We are looking for candidates to fill a post-doctoral researcher position at the Department of Epidemiology at the Columbia University, Mailman School of Public Health. The post-doc position will be at Columbia University, but we are a multi-disciplinary team of faculty at the Mailman School, the Columbia University School of Social Work, Drexel University, American University and the University of Washington. Strong candidates will have a Doctorate and experience and interest in social epidemiology, spatial epidemiology, neighborhood health research, GIS and/or urban health. Post-Docs will be able to collaborate on on-going and developing BEH projects and to develop their own research projects. On-going and developing BEH projects focus; 1) on the links between neighborhood built environments and obesity, physical activity, pedestrian safety, asthma, cancer, and cardio vascular disease, and 2) on developing new methods for characterizing neighborhood environments. Although many health determinants are outside of the health care sector, quality health care is crucial to population health. Recently, we included a look at perceptions of local health care as part of a community needs assessment (https://beh.columbia.edu/community-needs-assessment/) in Rio de Janeiro’s third largest favela. At the time of collecting data in 2015, only a geographic area with approximately 40% of the population was covered by the local family health clinic, and we thus expected that those outside of the coverage area might perceive greater barriers to care. However, when talking about public health care with residents during 14 semi-structured interviews, our colleague Débora Castiglione noted other salient concerns. She led the qualitative analyses and coauthored with Dr. Lovasi a paper just published in Qualitative Health Research. This paper highlights that residents felt disrespected or dehumanized in the process of seeking health care from the public system. Substantial delays and appointments missed due to the doctor’s absence were perceived as exacerbating vulnerability faced by pregnant women or during injury recovery, extending periods of uncertainty, elevated risk, or disability. Even in the face of scarce financial resources, residents would pay for private care if they could, in order to get timely care and feel well-received. Dr. Rundle’s March 2nd webinar for the ISBNPA webinar has been posted online at ISBNPA’s web site (Here and embedded below). His talk covered different approaches to assessing neighborhood walkability and the link between urban design and resident’s physical activity using New York City as a case study. He highlighted the challenges to measuring neighborhood form across multiple municipal jurisdictions and retrospectively over the past three decades.